Sideshow Toy has produced a wide variety of sixth scale figures, under a wide variety of licenses. But the first, the one that gave them their start, was the Universal Monsters. Produced first in a 9" scale, they switched to a 12" scale that has been extremely popular. 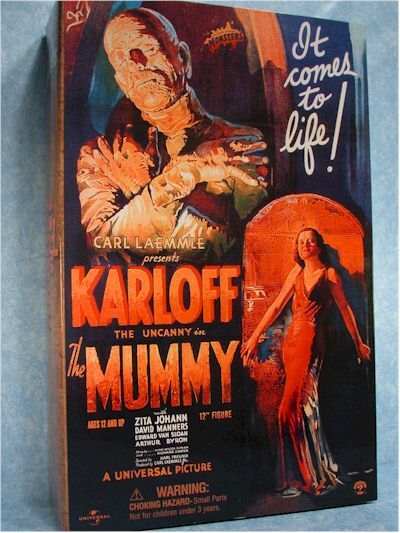 The latest figure in the series is Boris Karloff as the Mummy, perhaps the slowest and oldest of all monsters God knows, if women didn't have this propensity to fall down when running he would have never been a threat. 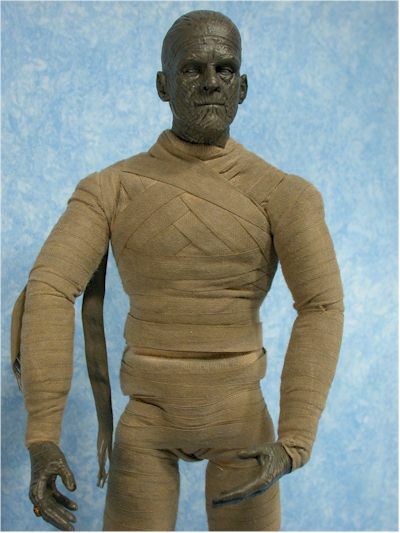 You can pick up the Mummy directly from Sideshow, and from other on-line retailers. Check the Where To Buy section for some suggestions. His SRP is $40, similar to the rest of the line, but you should be able to find a better deal than that if you take some time. This box is an example of Sideshow at their best. With terrific graphics from the film and advertising, and a completely collector friendly set up, it's the best of all worlds. The next evolution will be to provide a 'pose' to the figure inside the box, similar to what Drastic did with FDR and Custer, but this is still top of the line packaging. The sculpt looks extremely good, although it's hard to completely discern all the detail with the rather basic pain work. He mirrors the look from the film - the mud on my face and slicked back hair look that worked so well for the original movie - and the sculpting detail is also evident on the hands. They've included the all important ring on his right hand, and given plenty of detail to the wrinkles and lines of the hands. The paint ops on this figure are extremely basic, and the best work is on the accessories. But the gray of his face and hands is consistent, and the darker wash does a decent job of bringing out the detail. 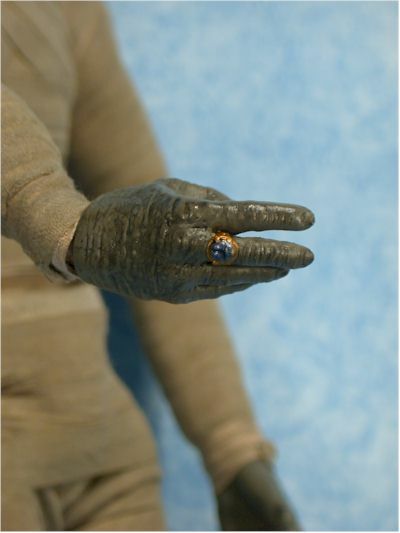 The highlight is the ring on his hand, which is very cleanly painted, and looks terrific against the drabber color of the hands. 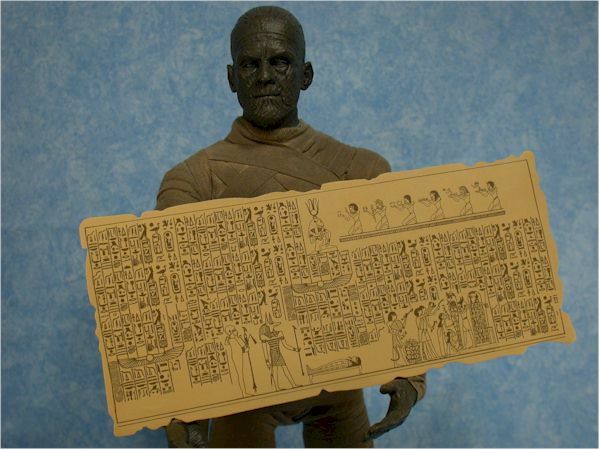 The design of the Mummy himself makes this type of 'action' figure a problem right from the start. The poor guy is wrapped head to toe, tightly, in ancient bandages, making it tough for him to move and walk. That's another reason it didn't require Olympic level skills to avoid this character. It also means that the figure ends up with some inherent problems. The tightly wrapped bandages on the figure means that the joints at the shoulders, waist and hips all become quite obvious. It hurts the overall appearance, and causes another major issue. I don't know if every figure has this problem, but mine has serious issues with the right arm. It's not uncommon with any sixth scale figure to have the figure dressed and the arms at odd angles. I've opened lots of figures where under the shirt and jacket the arms were in the opposite direction, and had to be moved around to get the articulation to work properly. That's what has happened here. The right arm was backwards, with the elbow bending forward and the bicep turned inward, when he was dressed. Normally, it's no big deal, since you can take off a jacket or shirt and rearrange things. Unfortunately, that's not possible here. Because of the tight wrapping, the arm hangs at an odd angle and nothing can be done. It may be the fault of the outfit, but he takes a major hit on the articulation as well. This is the usual Sideshow body, which is one of my favorites in terms of articulation. But the tight wrapping makes him almost a statue. The neck, shoulders and wrists are still pretty useful, but just about every other joint is immovable. The knees, elbows and ankles are particularly restricted. While I realize the outfit makes this the case, I think that using some sort of material that was more stretch - like an ACE bandage is - would have helped. The accessories are always excellent on Sideshow figures. There may not always be enough, but they are always excellent. This time, we get several very high quality items. 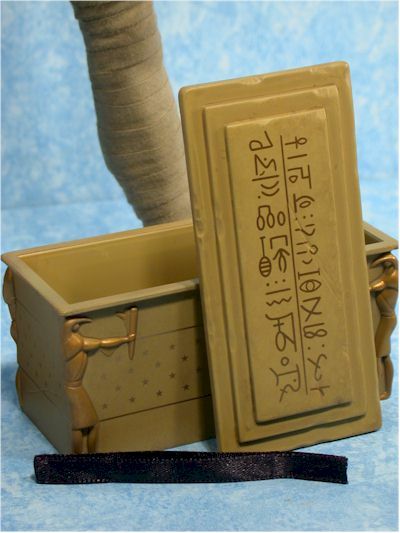 There's a great little box right out of his tomb, with various hieroglyphics and great sculpting around the base. The top fits perfectly, and it really looks excellent. There's also a large 'papyrus' scroll, which can be rolled up and tied with a black ribbon, right from the film. The scroll is fairly thick paper, and the writing is clean and neat. There's no display stand this time, which surprised me. I wonder if they are going to stop including them with future figures? 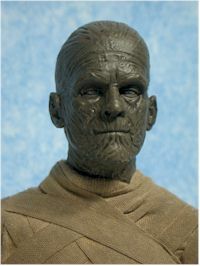 Of the 12" Universal Monsters produced so far by Sideshow, the Mummy is my least favorite. He's not terrible by any means, and he's certainly better than that God awful version Hasbro gave us a few years ago, but he's not at the same level as Murder Legendre or Mask of the Red Death. 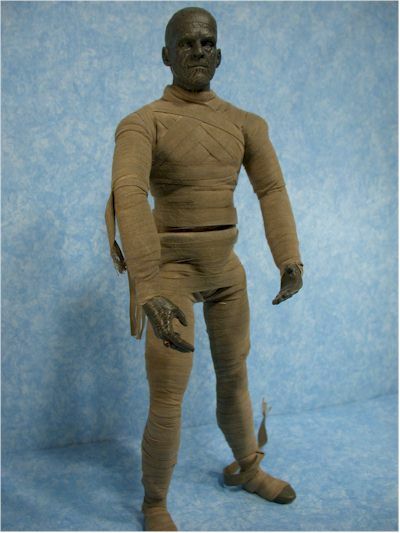 If you're looking for the major players in sixth scale format though, I doubt you'll ever see a better Mummy produced simply because of the issues inherent in the costume. - Sideshow sells them directly of course. They are $40 each, but I believe there's a MARCH coupon code right now that will get you 10% off in stock merchandise. - Aisle Sniper has them in stock as well. That's where I got mine, and he's just $33 there. - Big Bad Toy Store has them in stock for $35, plus a flat $5 for shipping.